1. Photographing the living scene and the living story. Grierson believed that to capture reality you must be in reality. Studios filmed acted stories against artificial backgrounds. He wanted the documentary to be an “un-staged actuality”, becoming cinemas new modern medium. 3. Material / stories taken from the raw will be more real in the philosophical sense than the acted article. Here we have spontaneity, a real chance at the truth. It can achieve an intimacy of knowledge. We will examine these principles in how they relate to two films viewed in class: Dziga Vertov’s The Man With a Movie Camera and Luis Buñuel’s Las Hurdes. 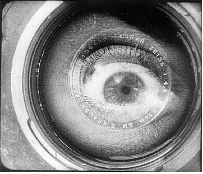 The Man With a Movie Camera (1929) follows Grierson’s principles of documentary filmmaking. For one, in it’s use of actuality footage. Vertov’s footage is all random; there is no set script (no dialogue), or artificial staged locations. 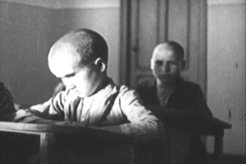 Vertov argued that the narrative coherence of Western cinema needed to be supplanted by a new language that directly represented lived reality and believed that the film maker’s essential tool was the use of actuality footage.1 Vertov follows Grierson’s first principle of documentary in terms of it filming actualities. In 1922 he created Kino- Pravda, a magazine that advocated the use of cinema to document real life as opposed to fictional narratives. He allied himself with the poet Mayakovsky, and declared that the "kino-glaz" (the eye of cinema) was ideal for the revealing the world of ordinary people. But there is something else behind Vertov exposing these actualities. Although there is no script at hand, he is using social actors and most is un-staged using “native scenes.” The real motive behind this film is to expose the inner workings of the camera, and to demystify the process of filmmaking itself. The Man with a Movie Camera involves staging and contrivance to an extent previously rejected by Vertov. But the artificiality is deliberate: an avant-garde determination to suppress illusion in favor of a heightened awareness" 2 We the audience are often reminded that we are watching a film when we see another audience watching the same film as us. He reveals the truth about film: that it can be just as contrived as fiction and must be viewed with a critical and educated eye. 3 Vertov is really saying to us that the documentary is cinema’s new modern medium. Finally Grierson says that materials taken from the raw can be finer, and that a spontaneous gesture has a special value on the screen. The Man With a Movie Camera is full of this. An example is when the cameraman follows in his car another car full of women. He films them on their ride and they react to him filming them. You have the usual “look, a movie camera!” look on their faces as they point and smile. Grierson also states that cinema has a sensational capacity for enhancing movements. This film is all about this concept. The scenes with the athletes in slow motion show in great detail the beautiful movements that a human makes in what would normally be looked at as a split second gesture. Here Vertov slows down the motion to make it last many seconds. Some may view this as mechanizing humans, but I believe that it is the opposite. It breaks down our most complicated movements into the most primitive and simple of motions. By cross cutting these movements with machines Vertov is showing that machines posses a “ballet mechanique” type of beauty as well. Buñuel’s Las Hurdes (1933) is known to be an essay in “human geography.” This film does follow some of Grierson’s principles but also borrows from Flaherty’s documentary ideologies. Like in Flaherty’s Nanook of the North (1922), Buñuel frames Las Hurdes as a film about the conflict of man versus nature by showing us the conditions in which they live in. For example the Hurdanos have to put up with fever inducing mosquitoes, the un-farmable land and poisonous snakes. Buñuel borrows the principle of immersing himself in the subject matter by living amongst the Hurdanos for a period of two months. Hardly the time frame Flaherty spent up north, yet you get the feeling that Buñuel became a citizen of this community. It’s residents, aside from the children, did not acknowledge the presence of a camera so it had the “living scene”, “living story” concept. Buñuel also used the actual inhabitants of the town of Las Hurdes and not professional actors. Grierson says that Flaherty lives with the people until the story is told “out of himself”, this is not the case with Las Hurdes. The narrator gives the film a surrealist and distancing feeling, more like he is dissecting the village and its inhabitants. The narration is often referred to as “as a matter of fact narration” and although you tend to empathize with the Hurdanos the voice over narration disaffects the viewer. So I would tend to agree with Grierson when he says, “it is important to make the primary distinction between a method which more explosively reveals the reality of it. You photograph the natural life, but you also, by your juxtaposition of detail, create an interpretation of it.” This juxtaposition of detail would be the voice over narration, which sets the film’s tone. It is interesting to note however that it seems like it is only the American voice over that gives the viewers this impression, the Spanish voice over according to various web sources tends to be more sympathetic. The last point on this film in which it follows Grierson’s principles is his third belief. Material taken from the raw will have a more realistic effect. This is certainly true for Las Hurdes. For example we see a real donkey die by bee stings, a goat “accidentally” falling off a cliff and villagers dying of diseases. We know as viewers that this is real and not acted out, thus increasing the wretchedness of their situation for us. 2 Barnouw, Erik (1993) Documentary: A History of the Non-Fiction Film. 2nd Ed. New York: Oxford University Press.